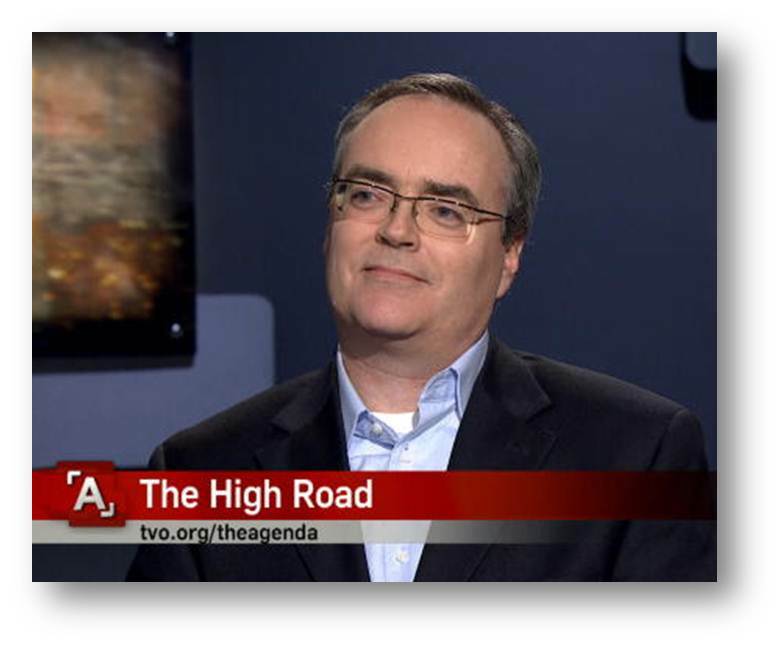 Back in February, 2007, seven months before The Best Laid Plans was even in print, Steve Paikin, the thoughtful and articulate host of TVO‘s, The Agenda, one of the finest public affairs show on the air, invited me on to talk about what was then, just a podcast novel. It was very kind of him. Fast forward four years and Steve invited me back to talk about The High Road. I was a little nervous stepping back into the The Agenda studio but as always, Steve made me feel very welcome and comfortable, at least until the make-up was slapped on and lights came up. We had a wide-ranging discussion and Steve’s questions had me racing around my brain in search of responses that were in some small way related to what he had just asked me! I survived (or perhaps you’ll feel differently when you watch it.). My thanks to Steve Paikin for having me on. Back in February of 2007, I interviewed a political wise guy named Terry Fallis. Terry has been around the block in the political world. He now plies his trade at an eponymously named consulting firm. But once upon a time, he was one of those back room boys who worked for politicians and tried to get them elected. He’s a smart guy and figured there must be a funny book somewhere inside him, given all of what he’d seen in politics. So he wrote a book, set on Parliament Hill, and followed the travails of a once naÃ¯ve, now a bit too cynical back room boy who’s seen too much of politics’ seamy underbelly. His book is called The Best Laid Plans and Terry rolled it out in unusual fashion. Once a week, he downloaded a chapter of his work into podcast form on his website. He narrates the action himself. He did it this way because no Canadian publisher would print his work. Not a one. So rather than wait for that, Fallis got the book into the readers’ hands with the newfangled technology so many of us are using these days. And what do you know: he ends up winning the Stephen Leacock prize for humour. While the credit is all Terry’s, I take a certain amount of pride in saying we were the first program to interview the author, when, quite frankly, no one was beating his doors down to give him any attention. So, to see and hear my conversation with Terry Fallis from last February, about his own political history, and his successful political novel, watch this web-exclusive video and enjoy. Thanks Steve. You were there at the beginning and I’m grateful.